Ringer's lactate solution (RL), also known as sodium lactate solution and Hartmann's solution, is a mixture of sodium chloride, sodium lactate, potassium chloride, and calcium chloride in water. It is used for replacing fluids and electrolytes in those who have low blood volume or low blood pressure. It may also be used to treat metabolic acidosis in cases other than those caused by lactic acidosis and to wash the eye following a chemical burn. It is given by injection into a vein or applied to the affected area. Side effects may include allergic reactions, high blood potassium, volume overload, and high blood calcium. It may not be suitable for mixing with certain medications and some recommend against use in the same infusion as a blood transfusion. Ringer's lactate solution has a lower rate of acidosis as compared with normal saline. Use is generally safe in pregnancy and breastfeeding. Ringer's lactate solution is in the crystalloid family of medication. It has the same tonicity as blood. Ringer's solution was invented in the 1880s with lactate being added in the 1930s. It is on the World Health Organization's List of Essential Medicines, the most effective and safe medicines needed in a health system. Lactated Ringer's is available as a generic medication. The wholesale cost in the developing world is about US$0.60 to US$2.30 per liter. For people with poor liver function, Ringer's acetate may be a better alternative with the lactate replaced by acetate. In Scandinavia Ringer's acetate is typically used. Ringer's lactate solution is very often used for fluid resuscitation after a blood loss due to trauma, surgery, or a burn injury. Ringer's lactate solution is used because the by-products of lactate metabolism in the liver counteract acidosis, which is a chemical imbalance that occurs with acute fluid loss or kidney failure. The IV dose of Ringer's lactate solution is usually calculated by estimated fluid loss and presumed fluid deficit. For fluid resuscitation the usual rate of administration is 20 to 30 ml/kg body weight/hour. RL is not suitable for maintenance therapy (i.e., maintenance fluids) because the sodium content (130 mEq/L) is considered too low, particularly for children, and the potassium content (4 mEq/L) is too low, in view of electrolyte daily requirement. Moreover, since the lactate is converted into bicarbonate, long-term use will cause patients to become alkalotic. Ringer's lactate and other crystalloids are also used as vehicles for the IV delivery of medications. In a large-volume resuscitation over several hours, LRS maintains a more stable blood pH than normal saline. According to an April 2019 US NRC Medical Generic Communication, Medical use licensees that use Strontium-82/Rubidium-82 (Sr-82/Rb-82) generators to produce Rb-82 for cardiac imaging [be advised] there have been two incidents in different states since December 2018 with patients injected with Rb-82 contaminated with Sr-82 and Sr-85 from generators eluted with Ringer’s lactate solution instead of sterile saline. Ringer's lactate solution is a mixture of sodium chloride, sodium lactate, potassium chloride, and calcium chloride in water. The calcium in the Ringer’s lactate solution replaces the strontium on the generator column. This results in the strontium being washed off the column when it is eluted. Ringers lactate should never be used to elute an Rb-82/Sr-82 generator for this reason. Ringer's lactate has an osmolarity of 273 mOsm L−1. The lactate is metabolized into bicarbonate by the liver, which can help correct metabolic acidosis. Ringer's lactate solution alkalinizes via its consumption in the citric acid cycle, the generation of a molecule of carbon dioxide which is then excreted by the lungs. They increase the strong ion difference in solution, leading to proton consumption and an overall alkalinizing effect. The solution is formulated to have concentrations of potassium and calcium that are similar to the ionized concentrations found in normal blood plasma. To maintain electrical neutrality, the solution has a lower level of sodium than that found in blood plasma or normal saline. Generally, the source of the constituent ions is a mixture of sodium chloride (NaCl), sodium lactate (CH3CH(OH)CO2Na), calcium chloride (CaCl2), and potassium chloride (KCl), dissolved into distilled water. Ringer's solution has the same constituents without the sodium lactate, though sometimes it may also include magnesium chloride (MgCl2). There are slight variations for the composition for Ringer's as supplied by different manufacturers. As such, the term Ringer's lactate should not be equated with one precise formulation. Although its pH is 6.5, it is an alkalizing solution. Ringer's saline solution was invented in the early 1880s by Sydney Ringer, a British physician and physiologist. Ringer was studying the beating of an isolated frog heart outside of the body. He hoped to identify the substances in blood that would allow the isolated heart to beat normally for a time. The use of Ringer's original solution of inorganic salts slowly became more popular. In the 1930s, the original solution was further modified by American pediatrician Alexis Hartmann for the purpose of treating acidosis. Hartmann added lactate, which mitigates changes in pH by acting as a buffer for acid. 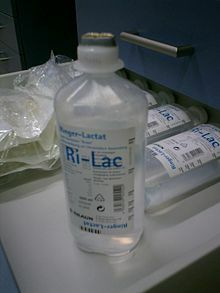 Thus the solution became known as "Ringer's lactate solution" or "Hartmann's solution". Ringer's solution technically refers only to the saline component, without lactate. Some countries instead use a Ringer's acetate solution or Ringer-acetate, which has similar properties. This was thought to be helpful when analyzing blood-lactate for signs of anaerobic metabolism (e.g. present with septic shock, hypovolemic shock). Subsequently it has been shown that lactic acid is metabolized much faster than infused; lactated ringers is not a cause of elevated lactic acid. It is used for the treatment or palliative care of chronic renal failure in small animals. The solution can be administered both by IV and subcutaneously. Administering the fluids subcutaneously allows the solution to be readily given to the animal by a trained layperson, as it is not required that a vein be located. The solution is slowly absorbed from beneath the skin into the bloodstream of the animal. ^ a b c British national formulary: BNF 69 (69 ed.). British Medical Association. 2015. p. 683. ISBN 9780857111562. ^ a b c d e f "Compound Sodium Lactate Solution for Infusion - Summary of Product Characteristics (SPC) - (eMC)". www.medicines.org.uk. February 2013. Archived from the original on 16 January 2017. Retrieved 14 January 2017. ^ a b Krieglstein, G. K. (2000). Atlas of Ophthalmology. Springer Science & Business Media. p. 377. ISBN 9783540780694. Archived from the original on 2017-01-16. ^ a b c d e f g h Marino, Paul L.; Sutin, Kenneth M. (2012). The ICU Book (3 ed.). Lippincott Williams & Wilkins. p. 363. ISBN 9781451161557. Archived from the original on 2017-09-18. ^ Saade, George R.; Foley, Michael R.; Phelan, Jeffrey P.; III, Gary A. Dildy (2010). Critical Care Obstetrics. John Wiley & Sons. p. 70. ISBN 9781444396140. Archived from the original on 2017-01-16. ^ "Sodium Lactate Compound". International Drug Price Indicator Guide. Retrieved 8 December 2016. ^ Marino, Paul L. (2013). Marino's The ICU Book (4 ed.). Lippincott Williams & Wilkins. p. 223. ISBN 9781469831640. Archived from the original on 2017-01-16. ^ Bjarby, Johan. "Vätsketerapi för AT/ST läkare KSS — 'Rehydration therapy for interns and specialists, KSS'" (PDF). Västragötalandsregionen. Archived (PDF) from the original on 16 January 2017. Retrieved 13 January 2017. ^ "LACTATED RINGERS (sodium chloride, sodium lactate, potassium chloride, and calcium chloride) injection, solution [B. Braun Medical Inc.]". HUMAN PRESCRIPTION DRUG LABEL. DailyMed. Archived from the original on 2014-08-26. ADVERSE REACTIONS [...] although the metabolism of lactate to bicarbonate is a relatively slow process, aggressive administration of sodium lactate may result in metabolic alkalosis. Careful monitoring of blood acid-base balance is essential during the administration of sodium lactate. ^ Williams EL, Hildebrand KL, McCormick SA, Bedel MJ (May 1999). "The effect of intravenous lactated Ringer's solution versus 0.9% sodium chloride solution on serum osmolality in human volunteers" (PDF). Anesth. Analg. 88 (5): 999–1003. doi:10.1213/00000539-199905000-00006. PMID 10320158. ^ Acid-base abnormalities in the intensive care unit. ^ "COMPENDIA NOTES, PART B: RINGER'S SOLUTIONS". Marine Biological Laboratory. Retrieved 10 June 2018. ^ "Table 3. Composition of Ringer's Solution". Research Gate. Retrieved 10 June 2018. ^ Miller, DJ (2004). "Sydney Ringer; physiological saline, calcium and the contraction of the heart". The Journal of Physiology. 555 (Pt 3): 585–7. doi:10.1113/jphysiol.2004.060731. PMC 1664856. PMID 14742734. ^ White SA, Goldhill DR (May 1997). "Is Hartmann's the solution?". Anaesthesia. 52 (5): 422–7. doi:10.1111/j.1365-2044.1997.090-az0082.x. PMID 9165959. ^ Kraut, JA; Madias, NE (11 December 2014). "Lactic acidosis". The New England Journal of Medicine. 371 (24): 2309–19. doi:10.1056/NEJMra1309483. PMID 25494270. This page was last edited on 9 April 2019, at 15:05 (UTC).